Browning of needles typical of Dothistroma needle blight. Jim Olis* and Brian Hudelson, UW-Madison Plant Pathology *Completed as partial fulfillment of the requirements for a BS in Plant Pathology at the University of Wisconsin Madison. What is Dothistroma needle blight? 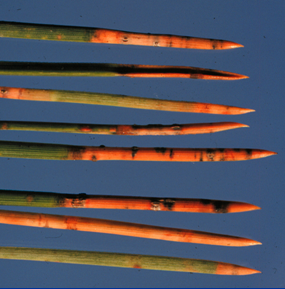 Dothistroma needle blight is a common needle disease that can affect over thirty species of pine trees. In Wisconsin, Austrian pines are most commonly and severely affected by this disease. What does Dothistroma needle blight look like? Dothistroma needle blight first appears as dark green, water-soaked spots on the needles. The spots become tan, yellow, or reddish-brown, and may encircle the needles to form bands. The tip of the needle beyond the band eventually dies leaving the base of the needle alive and green. Young trees are more likely to suffer damage than older trees. Seedlings (<1 yr. old) can be killed within a year after infection. Where does Dothistroma needle blight come from? 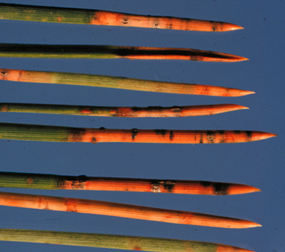 Dothistroma needle blight is caused by the fungus Dothistroma pini which survives in diseased needles. Watch for tiny, black reproductive structures of the fungus (called pycnidia) that can be found erupting from the surface of infected needles. Spores are produced in these structures throughout the growing season, and infection by spores can occur at any time, but particularly during periods of wet weather. Symptoms appear from five weeks to six months after infection. How do I save a tree with Dothistroma needle blight? Copper-containing fungicides (e.g., Bordeaux mix) can help prevent new infections, but will not cure diseased needles. Typically a single fungicide application in early June is sufficient to provide protection of new foliage. However, a second application three to four weeks later will provide more complete control. Be sure to read and follow all label instructions of the fungicide that you select to insure that you use the fungicide in the safest and most effective manner possible. Several years of treatments may be needed to completely rid a tree of all infected needles (through natural needle loss). Trees with severe infections (> 40% of the crown affected) may not survive and should be removed. How do I avoid problems with Dothistroma needle blight in the future? Do not plant Austrian pines as they are extremely susceptible to Dothistroma needle blight. Use white or Black Hills spruce, or white fir instead. When planting new trees, make sure they are disease-free. Be sure to provide adequate spacing between trees to ensure good airflow and promote rapid needle drying. If you have established trees that are suffering from Dothistroma needle blight, remove fallen needles from around the base of these trees as these can serve as a source of fungal spores. See UW-Extension Bulletin A2620, or contact your county Extension agent.